We are in the middle of planning for next years Bloomsday! If you are a Joycean, or have dramatic qualities...... In any way, we would be delighted to have you involved. This will be our 6th year . We will have main events in Bruff, but also hope to have some pre events in Limerick City. Maybe some exciting news soon about a a film premiere as part of festival . Short film now in production of modernised version of "Two Gallants"
Listen or Sing check Limerick Writers Centre for report! The ‘On the Square’ Songwriters & Open-Mic Music Session, upstairs in The Square Bar, St John’s Square, Limerick is situated in the heart of Limericks new artistic quarter. The session, hosted by Sean MacLeod, takes place every second Thursday at 8.30pm and welcomes musicians and singers to perform either their own original material or their favourite songs. Special guest this week is Chris Wood. Chris Wood has been playing the guitar and writing songs for nearly 20 years. Absorbing musical ideas from rock, folk, flamenco, blues, classical and African music he has developed his own intricate style of guitar playing and composition. Chris has taught the guitar in various formats for seven years and three years ago founded the Three Songs open mic night in the White House, Limerick. More recently he has been involved in the Limerick Songwriters sessions in the Locke Bar and The Blue Frog in Ennistymon. We welcome a wide variety of musical styles, from folk to alternative to spoken word. So if you want to take part come along early and sign up for the open-mic. 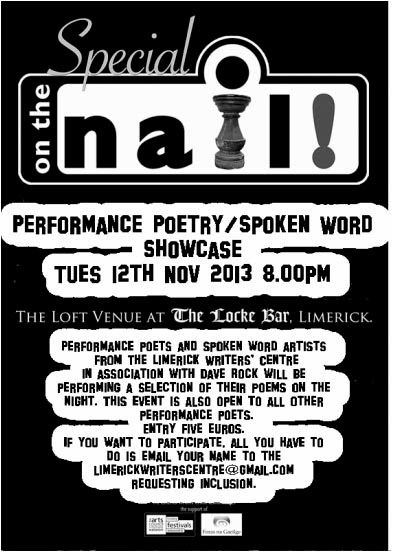 If you wish to play contact Dominic Taylor at limerickwriterscentre@gmail.com to book a spot or turn up on the night. 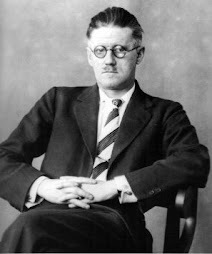 On 13 November 1938 Joyce finished writing Finnegans Wake. Bord Gáis Energy Book Club reviewed the long-awaited novel by Donna Tartt…find out if it was worth the wait. In The Goldfinch, we enter the world of Theo Decker who we find holed up in an Amsterdam hotel at the beginning of the novel. Why he is there is hard to tell, though we can guess that the painting of the title has something to do with it. Taking us back to where it all went wrong and to what Theo describes as “the dividing mark”, we hear of the fateful day when he came to have the painting in the first place but also, crucially, to lose the only person in the world who truly loved him. After his Mother’s death, his alcoholic father who had previously disappeared is un-traceable and he is sent to the house of geeky friend Andy Barbour, who he had once saved from bullies. Though the upmarket Barbour family are kind and interested hosts, it seems they have taken him in more for the adulation of society pages and when Theo’s father eventually returns, new white trash girlfriend in tow, he is immediately packed off to Vegas. In a new house in a deserted estate, Theo is largely left to himself despite being only 13 – his father and new girlfriend (“Xandra with an X”) spending most of their time in the city where, Theo later finds out, they earn their new-found money from drug-dealing and gambling. His loneliness and longing for home are only eased when he meets Boris, a boy in his school with a dead mother and similarly neglectful, but violent father. They strike up a very close bond that soon has Theo involved in Boris’ self-destructive ways with shop-lifting, drugs and alcohol filling their after-school evenings and hot desert nights. 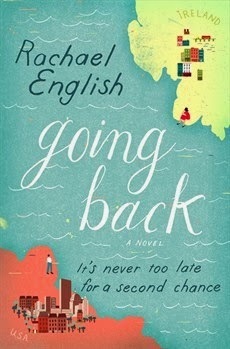 It’s only when Theo’s father dies, drunk after piling up bad debts and ploughing his car into a truck, does Theo decide to get back to New York and to the antique store which offered the only stability after his Mother died. But further tragedy awaits; the worry of the painting re-surfaces, and his return home fails to put him back on the right track. Though Theo’s story is tragic – full of guilt, regret and unhealthy obsessions – we are swept up so vividly in Tartt’s descriptions that it never becomes maudlin. Though we lose hope in his family, we see that the kindness of strangers could rescue him from the “brackish wreck” that his grief places him in and we leave our narrator in the philosophical acceptance that “fate is cruel” but “life – whatever else it is – is short”. With vivid characters, settings you can see and almost feel, and layered descriptions that immediately convey the pictures of Tartt’s imagination (“The breeze was as heavy as teakettle steam”, “flat-pad fingers”), The Goldfinch is a fast-paced novel that immerses you in Theo’s world from the opening sentence and will stay with you long after you’ve finished. This long-awaited novel from the author of bestselling novels The Secret Historyand The Little Friend does not disappoint. 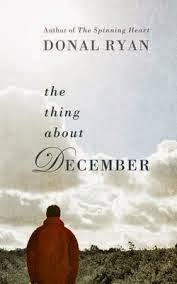 (Going Back) and Donal Ryan, (The Thing about December). Both have Limerick connections! @EigseMHartnett: The dates of the 2014 Èigse Michael Hartnett Festival are the 10th to 12th of April 2014. The Loft Venue @ The Locke Bar, Georges Quay, Limerick. Organised by The Limerick Writers' Centre this popular monthly reading and open-mic continues to attract audiences with a mix of poetry, prose and music.Everyone is invited to take part in the open-mic after the main event, poets, storytellers, musicians and writers. Come and commiserate if you did not get a grant from City of Culture! Even if you don't write you are welcome to bring something along to read. The night begins at 8.00pm and admission is free. So join us on the night and make this event something special. This month the guests are Simon Ó Faoláin, Maggie Breen Plus an excerpt from Cafe Talk performed by Claire Sadlier and Frances O'Brien followed by the Open-Mic. About Bloomsday Bloomsday is a celebration that takes place both in Dublin and around the world. 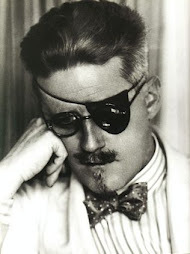 It celebrates Thursday 16 June 1904, which is the day depicted in James Joyce’s novel Ulysses. The day is named after Leopold Bloom, the central character in Ulysses. The novel follows the life and thoughts of Leopold Bloom and a host of other characters – real and fictional – from 8am on 16 June 1904 through to the early hours of the following morning. Celebrations often include dressing up like characters from the book and in clothes that would have been the style of the era. One of the hallmark fancy dress items of Bloomsday is the straw boater hat. Celebrations come in many different forms like readings, performances and visiting the places and establishments that are referenced in the book. The Bloomsday Breakfast is another common celebration, which involves eating the same breakfast as Leopold Bloom consumes on the morning of 16 June. This includes liver and kidneys alongside the typical ingredients of an Irish fried breakfast. Bloomsday in Bruff and Limerick Writer's Centre working together! SOME PICTURES OF PAST BLOOMSDAY'S ! "When I makes tea I makes tea, as old mother Grogan said. And when I makes water I makes water … Begob, ma'am, says Mrs. Cahill, God send you don't make them in the one pot." "A man of genius makes no mistakes. His errors are volitional and are the portals of discovery." 2. Joyce and the GAA ! 3. Read and study the full text of Ulysses at the bibliomania site. Bloomsday in Bruff : Sean Wall Restoration Co. Ltd. Watermark theme. Powered by Blogger.